Ever heard of Bunn BT Velocity Brew Coffee Brewer? It’s simple, efficient and most of all brews a great cup of coffee every time! If you’re looking for a new coffee maker, you’re probably seeking one with the right balance of looks, efficient brewing and ease of cleaning and maintenance. Unfortunately, such a unit is unusually rare unless you’re willing to invest in the high end units. Every coffee maker has its flaws. However, it’s better to find a coffee maker that lacks in design but gets you a delicious brew of coffee within no time. That’s what the range of Bunn Velocity coffee brewer offers and the most popular of this range is the Bunn BT Velocity Coffee Maker. Many design conscious coffee lovers might easily disregard this coffee maker due to its simplistic and bulky design. However, very few would be able to ignore this coffee maker’s ability to brew up to ten cups of delicious coffee within three minutes. It might not be a fancy coffee maker, but it’s something you might want to consider if getting a flavor filled brew is more important than fiddling with the latest coffee maker features every time you want your next shot of java. The problem with many of the modern coffee making machines is that they’re making the brewing process more complex than it should be. Before you get your shot of perfectly brewed java, you need to go through numerous loops and hurdles which not only take up unnecessary time, many won’t be justified by better tasting coffee. 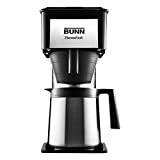 The Bunn Velocity coffee maker’s strength lies in its simplified brewing process. Simply fill the reservoir with water, plug the unit in and turn it on. This covers the preheating stage which heats the water to the ideal coffee brewing temperature. You can also use this water to brew a cup of tea. Next, add your grind to the filter and set it in the brew funnel. Place the carafe under the brewing funnel and you should have hot coffee within a few minutes. The brewing process is further simplified by the fact that the hot water reservoir has a capacity of two carafes. So a full tank will actually get you up to 20 cups of coffee. Any heated water that remains unused during the brewing process remains heated within the hot water reservoir. This means that you can skip the preheating process next time you need coffee if the reservoir contains hot water. Compared to other coffee making machines, the Bunn BT Velocity Brew coffee maker’s performance is largely unmatched. 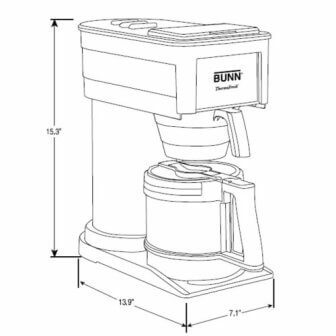 While most competing coffee makers boast of brewing times averaging 8 minutes, the Bunn BT has an average brewing time of 3 minutes. That’s 10 cups of coffee ready within 3 minutes. The best part is that the coffee is completely brewed. It’s not those half brews that coffee machines with an “auto pause” feature provide. Many consumers who own this unit agree that it consistently produces rich tasting coffee every time it’s put to work. The vacuum sealed thermal carafe will keep your brew hot for up to 2 hours. This eliminates the need to have an additional warming plate which would mean the unit consumes more electricity. This coffee maker is often compared with Technivorm and Oxo for the quality of coffee it brews. These are among top brewers in the market for excellent cup of coffee. The Bunn BT Velocity Brew’s design draws mixed reactions. With regards to its size, this coffee maker is quite large. With a height of over 15 inches, its taller than most countertop coffee machines that are considered “large”. The coffee maker also features plastic parts that aren’t of the best quality. 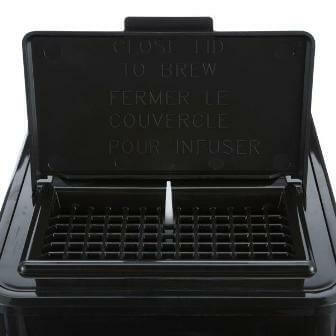 Some consumers have complained of a burning plastic smell when using this unit to brew coffee. These design flaws are compensated for by the inclusion of a stainless steel water reservoir and carafe. Besides wonderfully complementing the black plastic parts, the tank and carafe will keep brewing water and coffee warm. They’re also easy to clean and maintain. Cleaning the Bunn Velocity Brew BT involves hand washing the thermal carafe and its lid after use. It also involves occasionally wiping the outer surface of the coffee machine with mild soap and a damp cloth. It might be necessary to delime your unit especially if you use hard water to brew coffee. This will help to ensure that your coffee maker is working efficiently. Deep cleaning every 3 months is also recommended. The unit’s manufacturer recommends using white vinegar for deep cleaning. The Bunn Velocity Brew BT is made to cater for a select group of coffee lovers. If you prefer a coffee maker that gets the job done fast, this machine is a good choice. It comprises a simple design with all the necessary parts needed to brew coffee. Its ability to brew coffee within 3 minutes and keep it warm for up to 2 hours make it one of the best options for the person on the go or offices. Surprisingly, the major drawbacks with this coffee maker are seen in its design. It’s quite large so you might need to figure out where on your countertop you’ll place it before purchasing it. The burning plastic smell is also a common issue. However, most people report that it goes away after using their coffee makers a couple of times. 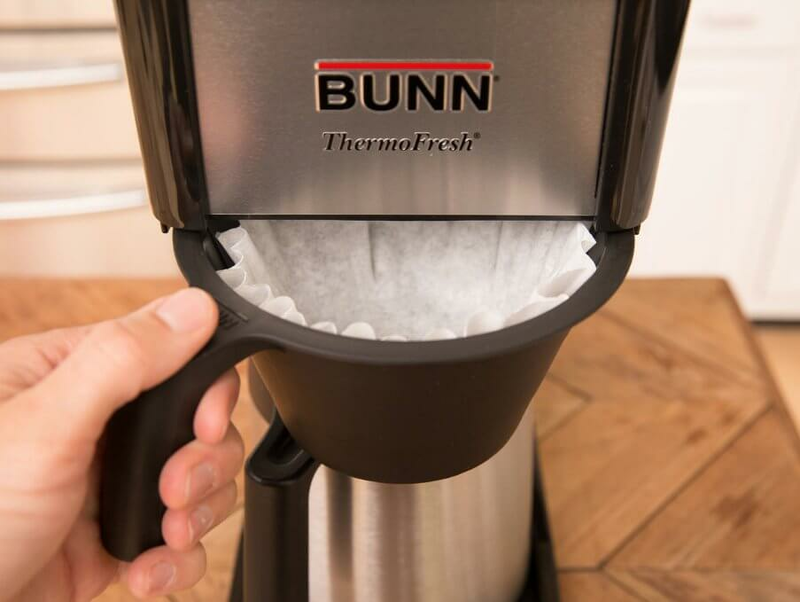 Overall, the Bunn BT Velocity Brew is a great choice if you don’t consider world class design as the main ingredient needed to brew perfect coffee.